At Midwest Restoration Services, we understand the negative effects that water damage can have on your home or commercial property. Water-related damages can occur from a variety of things in Illinois, from major storms and weather events to leaking toilets and dripping taps, your property is always at risk. The good news is, by taking a few extra home maintenance steps, you can work to help prevent water damage from occurring in your home. 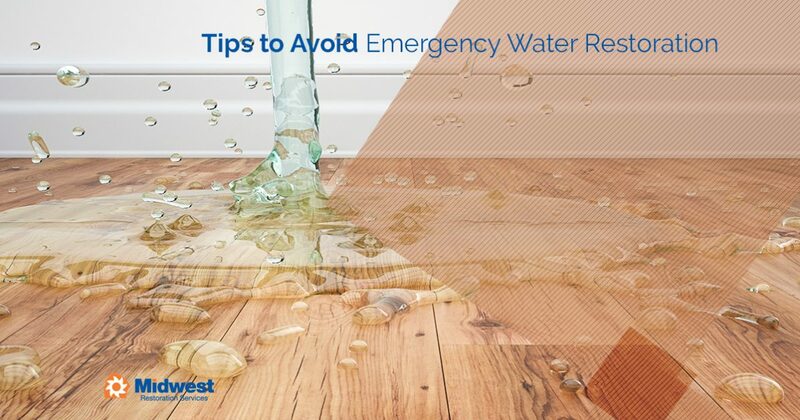 In this article, we’ll take a look at some tips to avoid emergency water restoration. If your home or business has suffered the devastating effects of water damage, it’s important to seek out a restoration professional right away. Contact the experts at Midwest Restoration Services in Batavia to help restore your home and belongings back to normal after a flood, storm, or leak. Did you know that falling trees and limbs can cause serious water damage during a storm? All it takes is one tree branch to compromise your home’s gutter system, which could ultimately lead to a leaking roof. To ensure your home is safe from loose tree limbs and branches, be sure to have your trees trimmed on a regular basis. If you live in an older home, there’s a good chance you have outdated appliances in your bathroom, kitchen, and laundry room. Older appliances can sometimes spring leaks without anyone noticing until it’s too late. When water damage is left untreated, it can lead to mold damage as well. In order to stay ahead of a leaking toilet or washing machine, make sure you have a professional inspect your appliances at least once a year. If you’re lucky enough to have a pool in your backyard, you’ll want to keep a close eye on the water levels during heavy rains and storms. This will help to prevent overflow or flooding into your home. If you plan on going away on vacation, consider draining your pool a little lower than normal or ask a neighbor to check on the pool after rainfall. This way, you can avoid the risk of having your home flooded by your pool. One of the most common causes of water leaks in the Midwest comes from a dripping tap. Taps can leak for a variety of reasons, either because someone didn’t turn it off all the way or because the tap was tightened too tight. This can lead to a water leak in your bathroom, kitchen, laundry room, or garage. If you’re concerned the taps in your home may be loose or dripping, call a local plumber right away to inspect your home. If your air conditioner or heating and cooling (HVAC) system is outdated, or the system was poorly installed, you run the risk of a water leak. There are a few do-it-yourself actions you can take to ensure everything is running as it should. Make sure to change the air filter at least once a month, and make sure the condensate line is free of any obstructions or kinks that could cause it to leak. It’s always a good idea to call a heating and cooling professional if your air conditioner isn’t running like it used to our you notice dripping water. If your outdoor hoses are old and worn out, or your hoses have suffered frost damage from the cold Midwest winter, there may be water leaking in your yard or lawn. Take some time to inspect the connection at the spigot for any signs of a loose connection. If you notice the connection is loose, try tightening it with a wrench or reinforcing the seal with pipe tape. As you can see, there are many things in and around your home that can lead to water damage. If you need assistance restoring your home or belongings from a flood, fire, or other disaster, contact the professionals at Midwest Restoration Services today. We look forward to hearing from you!